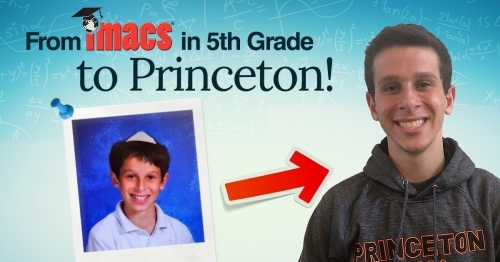 Congratulations to IMACS graduate Ty Kay who is beginning his studies at Princeton. Ty started taking IMACS Math Enrichment classes in 5th grade and went on to complete IMACS’ university-level courses in Computer Science and Logic for Mathematics. He is a National AP Scholar who earned 5Ã¢â‚¬â„¢s on the Calculus AB and BC, Computer Science A and Physics 1 exams. Ty scored 1580 on the SAT, including 800 on math section, as well as 800 on the SAT II subject tests in Math and Physics. As a student-athlete, Ty was a leader in the classroom and on the field. He and his teammates won the Technion’s 2017 Rube Goldberg Machine Challenge, an international competition, for which they were awarded one-year full scholarships. Ty’s pioneering performance in an independent course on Multivariable Calculus led his high school to establish a program allowing highly advanced students to study this challenging subject. A varsity soccer player for four years, Ty won MVP honors in 11th and 12th grade and was named a captain of the team in his senior year. Ty was accepted early decision to Princeton University where he will major in Operations Research and Financial Engineering after taking a gap year to study abroad.